I am so completely floored by this letterpress shop. The above images are details of the prints but I had to show them this way so you’d really understand how gorgeously rendered these are. Athenaeum Press produces limited-edition prints by Peder Singleton. The work up for sale now is part of his Urban Typography Project and feature a 3-color process for printing representations of old signage located in Salt Lake City, Utah. Gorgeous color combinations. I can barely get over it. I’ll most more soon. P.S. Nirali Magazine relaunches today. Apologies for neglecting this lately. You’ll see why when you see Nirali. 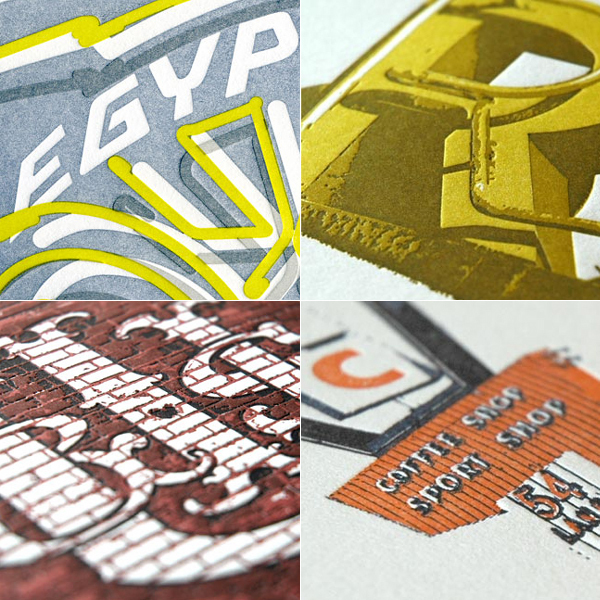 Clockwise from top left: The Egyptian, $125 (edition of 30). R, $75 (edition of 30). Classic Bowling, $125 (edition of 30). Utah Ice & Storage Co., $125 (edition of 30).